You can’t visit Antwerp without having experienced its nightlife. Antwerp is always exciting, at any time of the day, and there is always something going on. Any time is a good time to visit Antwerp. Are you planning to explore the city’s nightlife? This article has some tips for night owls and info about clubs in Antwerp. In Antwerp you don’t just visit a museum for the art. One of Antwerp’s museums also has some of the best views of the city. In the summertime the panoramic roof of the MAS | Museum aan de Stroom is open until midnight (free). From this landmark in Antwerp’s Eilandje district you can see the lights of the city and port twinkle as the sun sets slowly over Linkeroever. The perfect start to a romantic night. Eilandje is one of the trendiest neighbourhoods in Antwerp. Get a taste of the old port with its monumental warehouses, sheds and cobblestones. This distinctive old port neighbourhood to the north of the city is the place to go if you’re looking for a club. Schipperskwartier, also known as the Red Light District, is located between the trendy Eilandje and the historic city centre. There are plenty of fun, authentic pubs with nice terraces in this working-class neighbourhood that are open until the wee hours. Zurenborg is probably Antwerp’s most beautiful neighbourhood, with its elegant streets and stunning Art Nouveau façades. The beating heart of this neighbourhood is its square, Dageraadplaats, which is lined with pubs and restaurants. 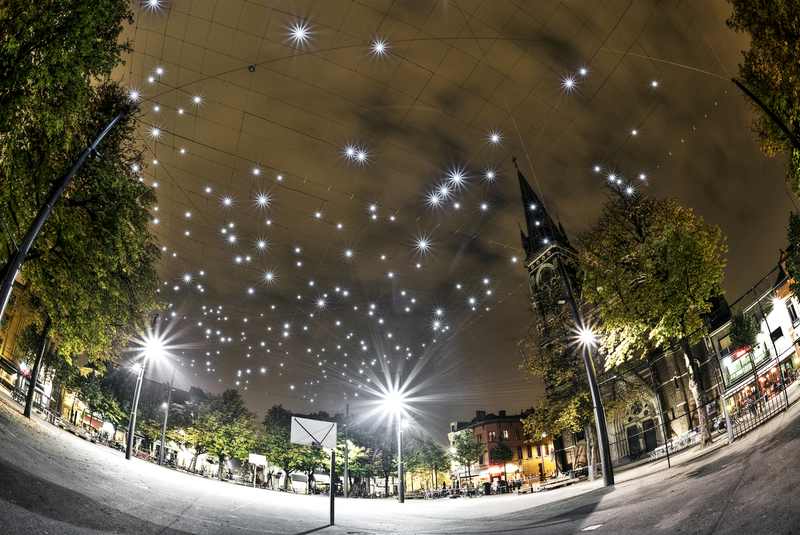 The lovely starry canopy above the square creates the perfect atmosphere. Start your evening on one of the terraces and then find a pub with some great live music. Real night owls should also check out Mechelseplein. Besides being a place for culture lovers, the square is also known for its many pubs and bars, which are open until about 6 a.m. Here you’ll find students on the terraces, regulars at the bar and lots of artists and actors, too. Grote Markt is the historic heart of the city. Everyone who visits Antwerp ends up walking through this stately square at some point. In the past, Grote Markt was also the epicentre of the city’s nightlife. Over time, bars and clubs moved to the districts outside the city centre and the neighbourhood lost its status as the favourite haunt of night owls. Fortunately, this is set to change thanks to a bunch of new hip pubs in and around the most photographed spot in Antwerp. Antwerp is an inspiring city. People don’t believe in following trends here. Instead, they create them. From surprising fashion designed by “The Antwerp Six” to classic paintings by Rubens and Van Dyck: learn more about Antwerp’s creative image during Museum Night. On the first Saturday of August, you have one night to visit all of Antwerp’s museums. Are you up for this challenge? Antwerp museums will stay open late and if the afterparty proves one thing, it’s that a museum visit in Antwerp is never boring. Want to know about the favourite hangouts of Antwerp locals? Then check out the This Is Antwerp website (and download the TIA app). Besides a calendar with the best parties, they also have a list of hidden places in the city. Read all about art, fashion, music and lifestyle in the This is Antwerp magazine.